After the five-hour car ride we were all glad to have finally arrived at San Quintin. As we drove through the Baja California countryside, we noticed that mud was everywhere. This area gets rainfall. But the storm that had just passed brought with it several inches in a matter of hours. That storm not only left behind mud, but there were puddles large enough to fit 10-12 cars just off the highway. The problem with mud and water didn’t really register with me until we arrived. 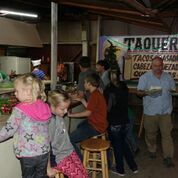 Our first stop was one of the Roberts’ favorite taco shops. Ramon parked his motor home to the side and I parked right behind him. As we piled out of the vehicles, our shoes sank in the deep red mud. When I looked down the street where we had parked, I saw a huge lake where there once was road, cars plowing through the water just barely making it to more solid ground. After eating some of the best tacos in the world, we headed for the hotel and the adjacent campground where the Roberts would hook up their motor home. The directions we got from the web said to go one road past the Old Mill Restaurant sign and turn right. There are no street names or addresses. So, we went one road past the sign and discovered that in place of a road was a muddy swamp. We carefully navigated around large potholes and deep puddles. I quickly learned never to stop the car. The best way to get through the mud was to go as fast as possible. By the time we reached the hotel, our blue Toyota Matrix was now a reddish brown. We checked into the beautiful hotel and met up with all the group members. The activity for that night was to attend the branch Christmas party. Our group was assigned desert for the party. Mary and Jeff brought four large Costco cakes. So, we all got back into our muddy vehicles and made our way out of the swampy road to get to the chapel. The chapel was an amazing building. It was white and brown and well landscaped. The interior was impressive. The floor was tiled and the whole building was inviting. The party was to start to 5:00. We didn’t leave from the hotel until after 5:30. My Germanic genes, deeply encoded with punctuality, grew concerned that we were going to be late for the party. Those accustomed to San Quintin laughed at my Teutonic ways. While the party may start at 5:00, people will not begin to arrive until 7:00. When we arrived at the chapel, we were met there by the missionaries – Elder Hernandez from Oaxaca in Mexico and Elder Vasquez from Ecuador. These two missionaries were loved by the branch members and an integral part of the community. There was also a handful of members onsite when we arrived, but by 7:00 that building was filled. We had nine children in our group under the age of 15. The idea of being among people who looked different and who spoke only Spanish was a challenge for them at the start. 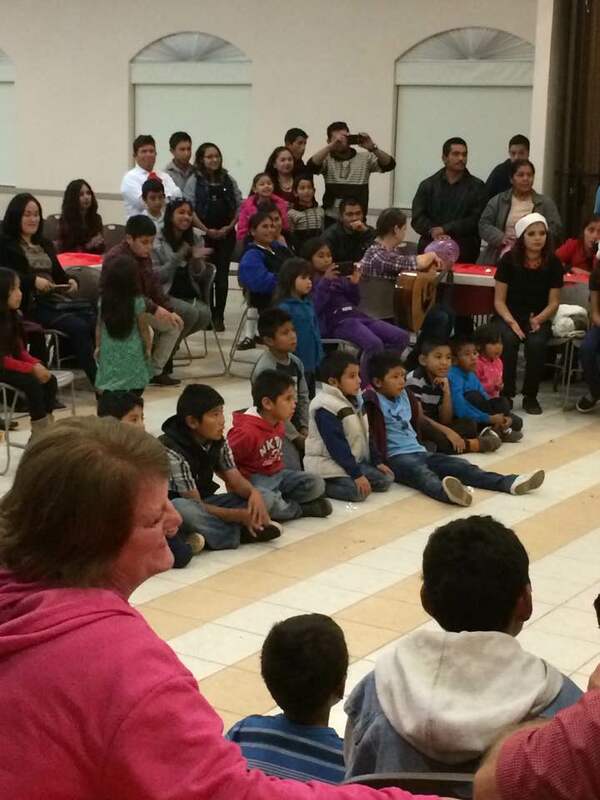 The parents tenderly coaxed their children to mingle with the Mexican children. At first, the American children stayed close by their parents. By the end of the party, all the kids, Mexican and American, were freely interacting with each other and finding ways to communicate beyond language.